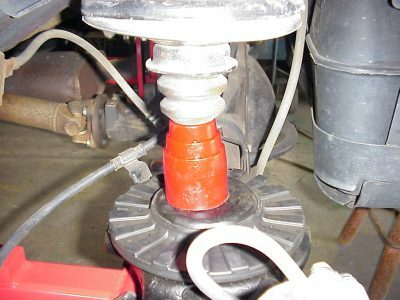 Rear bump stops are need to keep the rear shocks from bottoming out on themselves and damaging the cylinders. The best way to set up rear bump stops is to remove the springs and attach the shocks and then jack up the rear axle till the shocks bottom out. Then measure the distance between the factory bump stop and the bump stop pad. You need to fill the gap plus 1/2" to 3/4" to keep the momentum of the compression of the suspension from bottoming out the shock. So if the gap from the factory bump stop and the bump stop pad is 2" mount a 2.75" bump stop on the factory bump stop pad to hit the factory bump stop. This will keep the shock from hitting its self and destroying the cylinder internally. Hi, I had a quick question. I ordered an adjustable track bar a couple weeks ago and jsut realized that the only long arm kit includes the track bar. If i would like to get the long arm kit would i jsut have to accept the 2nd adjsutable track bar?